We offer a wide portfolio of services including precision shearing, breaking, forming, drilling, riveting, soldering, and welding. We work with a range of materials including Stainless Steel up to 18 gauge, Galvanized up to 16 gauge, Aluminum up to .090”, Copper and Brass up to .090”. Specialty metals are available upon request. In addition to fabrication of standard items, we can also provide concept prototyping to help you turn your ideas into reality. From individual pieces to multiple unit orders, GZ Metal Craft has the experience and expertise to create the items you’re looking for. No job is too big or too small. 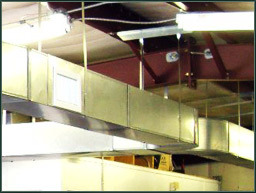 Every day we help our customer create everything from ducts and vents to hoods, tables, trays, carts, and much more. We do it all with the highest standards for service, dependability and craftsmanship.